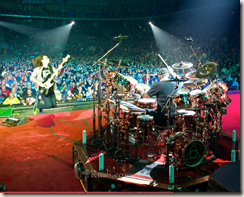 Rush were back in action last night to start Leg 2 of the Clockwork Angels tour. Nothing like a Geddy Lee jumping in front of Neil Peart! Photo courtesy of John Arrowsmith and Rush. Click the image to see a larger version at Rush.com.